Build 1 of 20 models, then take it apart and rebuild a new model. 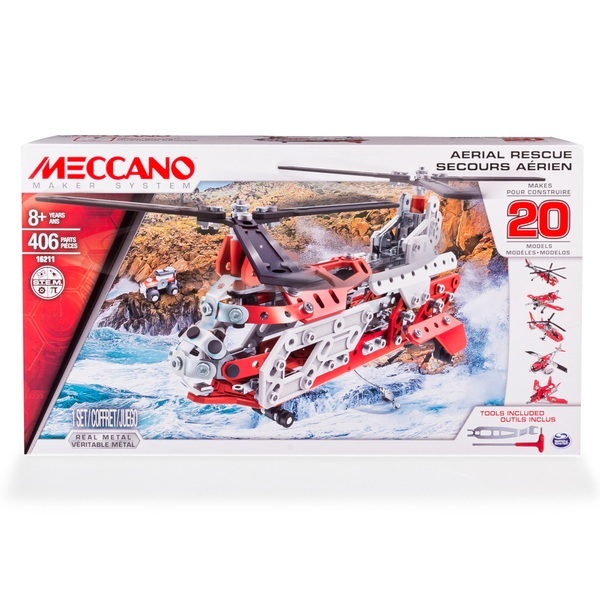 Explore the world of real engineering with the Meccano 20 Model Aerial Rescue Set. Build 1 of the 20 aerial models or use your imagination to create a vehicle of your own design! Use your imagination as you explore the world of real engineering with the Meccano 20 Model Aerial Rescue Set. Build 1 of the 20 aerial models, including a helicopter. Then take it apart and build a different one. After that it’s up to you and your imagination to create a vehicle of your own design! This real working Aerial Rescue set comes with 406 parts, 2 ergonomic tools and easy-to-follow instructions. Explore the mechanical wonders of the world with the 20 Model Aerial Rescue Set. The future is yours to build with Meccano!